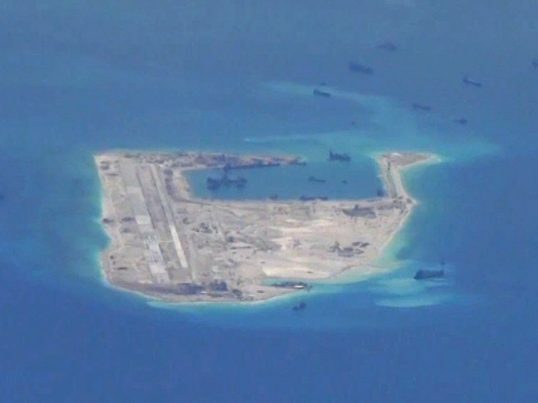 (NationalSecurity.news) The Chinese government has reacted with fury after a U.S. Navy destroyer sailed to within 12 nautical miles of manmade islands Beijing has constructed in the South China Sea, summoning the American ambassador and claiming that it is “not afraid” of war with the United States. “This can convince the White House that China, despite its unwillingness, is not afraid to fight a war with the U.S. in the region, and is determined to safeguard its national interests and dignity,” the editorial, from the Global Times, reported. The editorial did, however, go on to call for restraint as it repeated a common theme across Chinese media that Beijing has the high moral ground in not being provoked into a conflict. The China Daily, meanwhile, claimed in an editorial of its own that the U.S. was “making trouble out of nothing” and further accused Washington of employing double standards in accusing China of militarizing the South China Sea. ‘Like’ NationalSecurity.news on Facebook! Click here! “The U.S. warship displays exactly who is the real hand pushing the militarization of the South China Sea,” the China Daily editorial added. The guided missile destroyer USS Lassen was the vessel sent to navigate the waters off the Chinese island. In addition, the Chinese government summoned U.S. Ambassador Max Baucus, former long-serving Democratic senator from Montana, to lodge a formal complaint. U.S. officials and the Pentagon have repeatedly said the action was not a provocation but taken to underscore the strategic importance of the region, in keeping international waters open for free navigation by all ships, military and, especially, cargo. “We will fly, sail and operate wherever international law permits,” Defense Secretary Ashton Carter said last month. China is claiming most of the South China Sea – claims which overlap the internationally recognized 200-nautical-mile economic exclusion zones around several other nations in the region including Vietnam, Malaysia, Brunei, the Philippines and Taiwan, which have rival claims. Workers on the fabricated island near where the USS Lassen sailed are currently building a 2-mile-long airstrip that will be capable of handling fighter jets and transport aircraft. Some experts don’t believe Beijing is in any mood to take on the U.S.
“It seems like China’s reaction – at least initially – has been to respond in a restrained, operational way. The Chinese have absolutely no interest in sparking a tactical crisis or any kind of confrontation with the Americans,” Ashley Townshend, a South China Sea expert from the University of Sydney’s United States studies center, told The Guardian.